Eggs can be one of the best way to get rare Pokemon in Pokemon Go. They do however come with some limitations primarily that your going to need to walk.......WALK A LOT! To get started you find Pokemon Eggs and Pokestops and you are also provided one incubator. Soon as you get a Poke Egg put into the Incubator. This Incubator can be used infinite times but others you receive later can only be used a limited number of times. To open the egg you need to walk a certain distance with your Pokemon Go game opened. 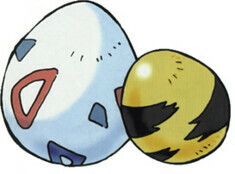 2) What Pokemon is it? 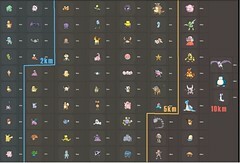 The Kilometers you need to walk to open the egg narrows down what type of Pokemon is in the egg. Generally the longer the distance the more rare the Pokemon. This graph shows which Pokemon fall into which kind of egg. Click into chart to see all of the different Potential Pokemon that could be in the Egg based off of Distance. You can not drive or move to fast otherwise the game will not register the distance. You need to hoof it. It is very hard to cheat on this. We recommend just doing what the game intended and walk. You will receive some Incubators for leveling up. However, we think it is a good idea to buy a couple of Incubators if you are serious about the game. The advantages of hatching a bunch of Pokemon and the XP received are pretty major. This might be one of the best tips in the game as Lucky Eggs can really boost XP by a lot if you use them right. It is absolutely critical that you use them right. The Lucky Egg is a special item that when used gives you double XP for 30 minutes. Before you use a Lucky Egg we recommend getting a multiple Pokemon ready to evolve, being fully stocked with Pokeballs, and having a Lure ready to use at a Pokestop. When you kick off the Lucky Ball evolve all of the Pokemon then set the Lure at the Pokestop. This will give you massive amounts of XP and let you level up quickly. All these things you do will give you double XP. Another idea is to take on a gym if you are ready to do so. That also can provide a massive boost to your XP.